Pizza ... and one hell of a salad bar. It’s been a quarter of a century since Wisconsin-based franchise Rocky Rococo began serving beastly rectangle-shaped pies in Spokane, and not much has changed since. Same photos on the wall, same tile flooring, same fake plants, same old phone booth. 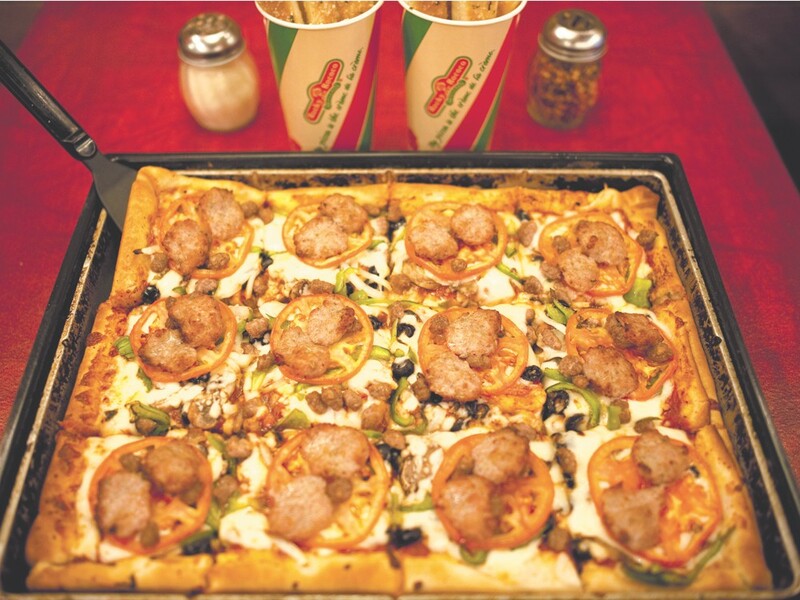 Many childhood memories have formed around their same classic pizzas — birthday parties, sports team gatherings and family nights out. And, though most other restaurants evolve and change with the times, when it comes to Rocky’s, they knew their niche and stuck with it. And it keeps customers happy. “They have the greasiest breadsticks I’ve ever had — in a good way,” says customer Dean Reiner. By the slice or by the whole, served on a sizzling iron pan, the classic pepperoni ($3.79, $20.25) rules in popularity. And yes, those greasy, cheese-encrusted dough sticks of lovin’ ($2.39) are still served out of an Italian flag-emblazoned waxed paper cup.